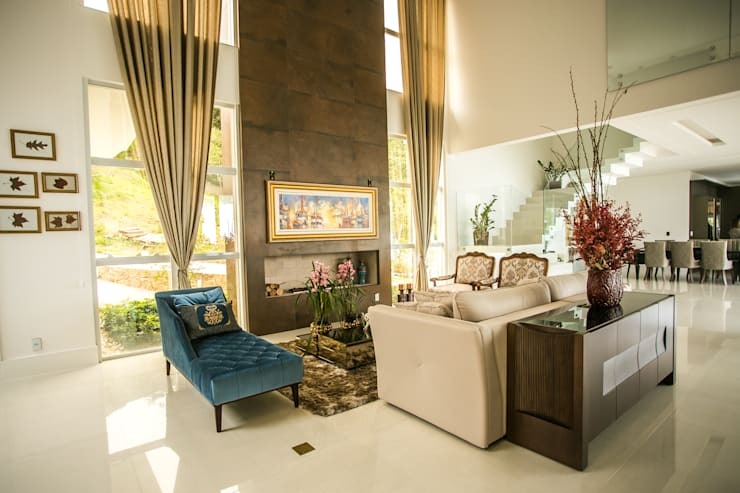 This stunning property, brought to us by the creatives at Brazil's Roma Arquitetura, showcases an enviable modern mansion oozing plenty of luxury and opulence. Immediately engaging from the street, the home's facade has been constructed of a cool combination of white walls, interspersed with timber panels and a chic ream of mirrored glass, which flows up the centre of the exterior. 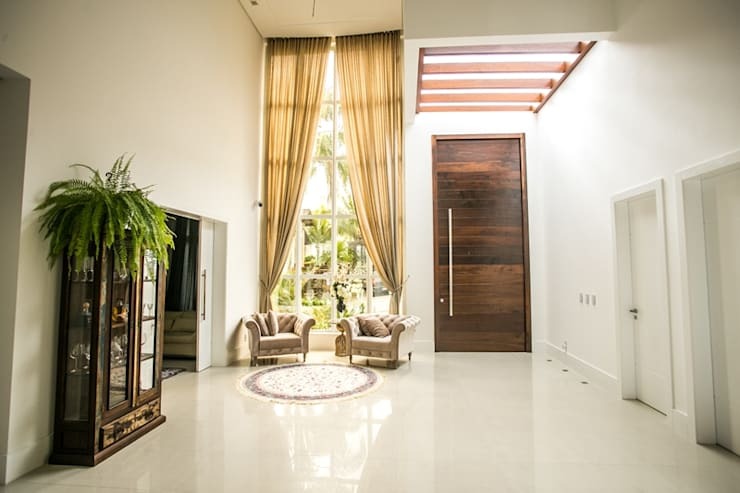 Moving inside and we're met with a beautiful design, as the dwelling's high walls and ceilings create a lofty and light atmosphere, while its furnishings infuse the space with an air of palatial luxury. Classic pieces with fine finishes populate the sitting and living rooms, with each space also bathed in light by virtue of the home's incredibly high windows. 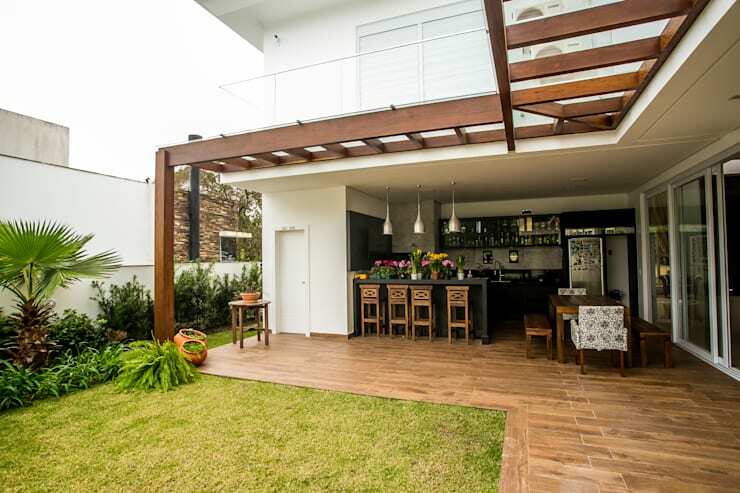 The rear of this abode also hosts plenty of luxurious appeal, with expansive decking supporting an outdoor kitchen, bar and dining setting—perfect to accommodate a lively, summer soiree! Bordering the area for outdoor living is a pristine swimming pool, with a surprise in store beneath its gentle ripples, as one wall of the pool has been constructed of glass to provide a stunning view of the home's lush, green surrounds. Located in a stylish, suburban neigbourhood this home cuts a fine figure in the midst of its lush garden of tropical plants. 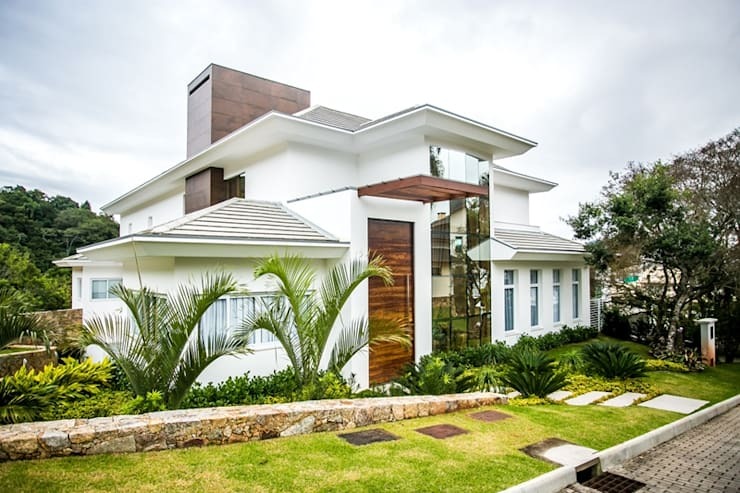 Its primarily white exterior has been augmented with panels of dark timber for a lovely contrast of colour and texture, while a vertical strip of mirrored glass runs down the front of the facade, reflecting the home's surrounds and creating an almost post-modern effect. Moving through to the interior and we're immediately entranced by the home's high ceilings and spacious atmosphere. Even the front door is impressively tall, with the deep tones of its timber construction exuding an inviting appeal. By the door a small sitting space has been created, housing two luxurious armchairs in front of the central window. Bathed in light, the space allows for a lovely, private view of the home's surrounds. The home's living room exudes an air of palatial style, with its opulent furnishings creating a cosy space to relax and interact. A stunning, blue chaise draws focus within with space, while the textured hue of the shaggy rug, sheen of the contemporary coffee table and ornate pattern of the armchairs combine to round out the living room's luxurious atmosphere. Best of all are the enormous windows bordering the space, providing streaming sunlight and a gorgeous view of the greenery outside. 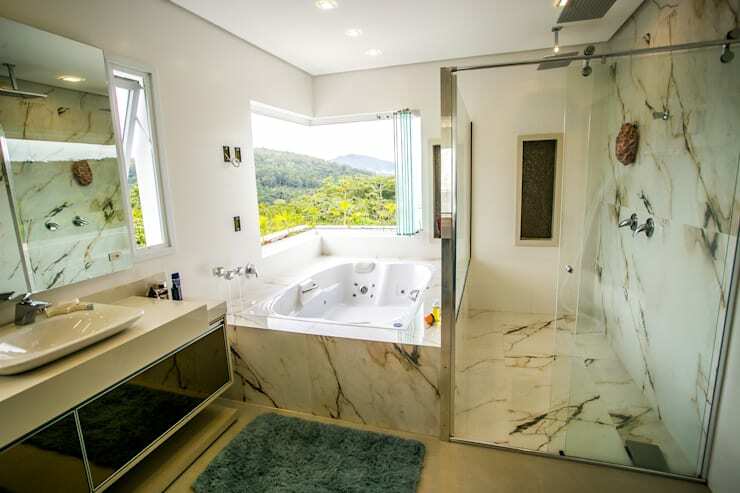 The home's bathroom has also been infused with an opulent air, with marble tiles lining the spa bath and shower, engaging onlookers with their luxurious sense of style. Both the shower and spa appear spacious and inviting, while a generous expanse of windows have been included in order that the occupants might admire the stunning, green vista bordering their home. Moving through to the rear of the property and we stumble across this enviable area for outdoor living, with a generous stretch of timber decking housing a kitchen, bar and dining setting. The space has been decorated to perfection, with a large, wooden banquet table standing ready to host a lively, outdoor get-together, and the kitchen and bar primed to provide plenty of food for thought. 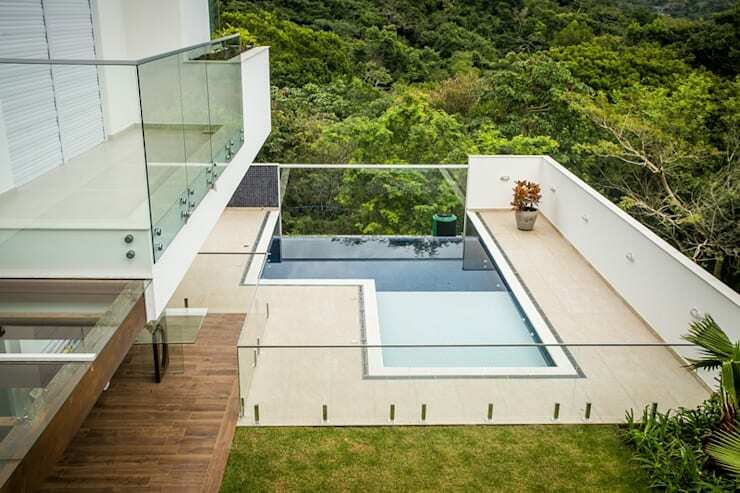 Flanking the home's outdoor entertaining area rests its crowning jewel, with this pristine swimming pool having been constructed, overlooking the lush, green woodlands beyond. Humble in shape and size, the pool still emits plenty of charm and style, with a glass wall included at the far end so that the occupants can enjoy a picturesque view both above and below the water. For another example of a beautifully designed home with a pristine pool out the back, take a tour of A Classic Home of Colour and Light and get inspired! What's your favourite design element within this magnificent home? Tell us below!